Any candidate from an English Medium School of any Board can register for the Entrance Test. Please Download the Registration Form and Admit Card. Alternatively, the Registration Form can be collected in person form Admissions Office of the school. Photo-copy of the candidate’s Birth Certificate. Attested photocopy of the Annual Exam Mark sheet of the previous year. If you have paid the Registration Fee by an online funds transfer, then kindly take a print-out of the transaction details and attach the same to the Registration Form. P.O. Balipara, Dist Sonitpur, Assam. A unique Registration Number is provided to each candidate upon successful Registration. Instructions regarding the Written Test are sent to all registered candidates. The Entrance Test is generally conducted in the month of November and it includes a Written Test and an Interview. 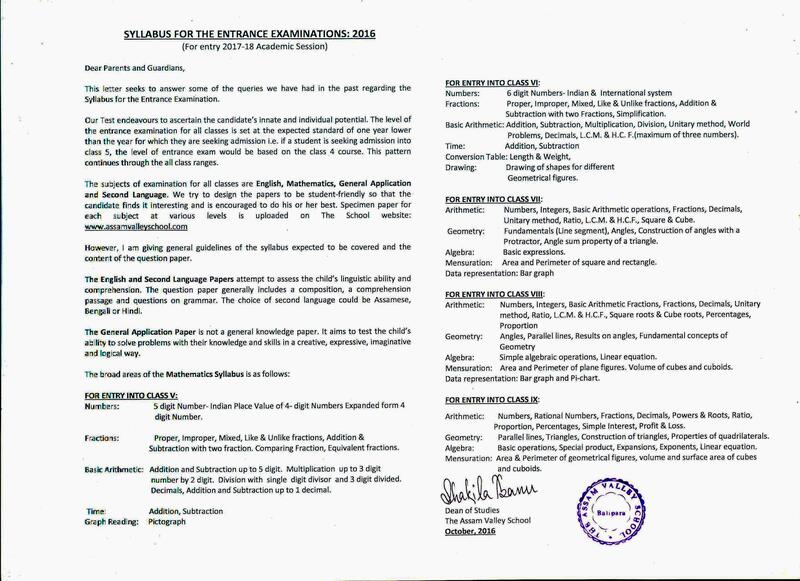 The candidate has to appear for a written test in English, Mathematics, General Awareness and 2nd Language (Hindi/Bengali/Assamese). The Interview of the candidate is done in presence of the parents. Interaction with the parents is an important part of the admission procedure. The final selection is based on the performance of the candidate both in the Written Test and the Interview. 80% weightage is given to the Written Test and 20% to the Interview. The Academic year starts in the month of May every year and the new students are expected to join the school on a specific date, mentioned in the formal Letter of Admission. On Induction Day, parents are required to submit the required documents as mentioned in the Admission Booklet. For further details or queries, please send us an email at mail to: admissions@assamvalleyschool.com or call us at +919954620600 / +919954932200.